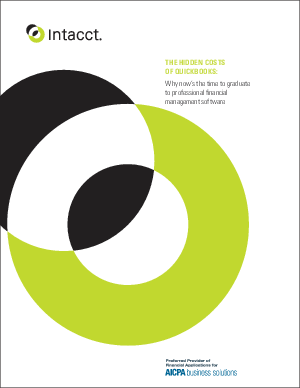 If you're like most businesses, you've been using QuickBooks to manage your company's financials. It's well known. It's easy. It works. And it offers the functionality a business needs when it's starting out. But if your business has moved beyond the entry level, QuickBooks may be costing your organization-slowing growth, stalling revenue, and draining productivity. If you need deeper functionality, improved automation, more robust security, tighter internal controls, and greater visibility, it may be time to switch to a new accounting system. How can you be sure?